Hans Scholl (September 22, 1918 - February 22, 1943) was a young college student living in Germany who is remembered for helping to publish and distribute leaflets for the White Rose non-violent resistance movement that opposed Nazism during World War II. Scholl and his group questioned the dictator Adolf Hitler and his brutal policies against the Jews. After being arrested for distributing the group's sixth leaflet, Hans Scholl, along with his sister Sophie Scholl and Christoph Probst were convicted of treason. They were all executed by guillotine only a few hours after their trial. Scholl was raised as a Lutheran but joined forces with Catholics who were led by their consciences to resist the Nazi ideology with the universal principle of self-sacrifice. Their fourth leaflet concluded "We will not be silent. We are your bad conscience. The White Rose will not leave you in peace!" Hans Scholl was born on September 22, 1918 to Robert and Magdalena Scholl. His father, Robert, participated in politics, being mayor of Ingershein near Crailsheim. The family then moved and Robert served as the mayor of Forchtenberg am Kocher. The Scholl family valued education and freedom of speech. His parents encouraged all the Scholl children to think for themselves, to form opinions, and to value ideas. In 1932, the Scholl family moved to the city of Ulm, where Robert established his own consulting office. It was during these years that the Scholl children were required to join the Hitler Youth groups. The Hitler Youth groups promised a united Germany. They were to be happy and productive groups that worked on the mental and physical improvement of Germany's rising generations, and because of this, Hans was excited to be a part of it. However, Hans slowly became very critical of the group as he discussed it with his father, who was emphatically against the rising power of Adolf Hitler. His disappointment in the Hitler Youth, and National Socialism in general, led Hans to join the Jugendbewegung (Youth Movement). This movement concentrated on reading the books that were ordered to be burned by Joseph Goebbels, Hitler's propaganda manager. In 1937, Hans Scholl was arrested and briefly jailed after being accused of subversive activities involving his participation in the Youth Movement. In 1939, Hans was drafted for a two year service in the military. This allowed him to begin studies in medicine at the university. It also brought him into contact with several friends who shared his same beliefs about the government. In the summer of 1940, Hans was part of the German Army invading France, where he served as a member of the medical corps. When Hans returned to Munich he formed the "White Rose" Resistance movement. He was joined by his sister, Sophie, and several of the friends: Christoph Probst, Kurt Huber, Alexander Schmorell, Willi Graf, and Jugen Wittenstein. Several members of the group had witnessed Nazi brutality first hand and thus they adopted the strategy of passive resistance. These students decided to fight against racial discrimination in Germany. Their main form of attack was with words. The group met together to publish leaflets that called for the restoration of democracy and social justice. In 1942, the White Rose took on a more active role after Hans' experience as a medic during Operation Barbarossa. Until this time, Hans had only heard about the cruelty the Jews were suffering, but over the next few months, he saw first hand the horrific treatment they were subjected to. Also serving with him were his fellow classmates from the university: Alexander Schmorell, Willi Graf, and Jugen Wittenstein. Together, they witnessed the murdering of several Jews by the Schutz Staffeinel (SS) in the Warsaw Ghetto in Poland as well as the horrors taking place in the Soviet Union. When Scholl returned to Germany in October, 1943, he and the White Rose had more than enough information to fuel their leaflets. They began publishing leaflets en masse, going into detail about the murderous mission of the SS. While the leaflets were first sent to names and addresses taken from telephone directories, they wanted to concentrate their efforts on mailing to university lecturers and the owners of bars. Quoting extensively from the Bible, Aristotle and Novalis, as well as Johann Wolfgang von Goethe, Friedrich Schiller, and Lao-Tzu, they appealed to what they considered the German intelligentsia, believing that they would be intrinsically opposed to Nazism. In Passive Resistance to National Socialism, published in 1943 the group explained the reasons why they had formed the White Rose group: We want to try and show that everyone is in a position to contribute to the overthrow of the system. It can be done only by the cooperation of many convinced, energetic people—people who are agreed as to the means they must use. We have no great number of choices as to the means. The meaning and goal of passive resistance is to topple National Socialism, and in this struggle we must not recoil from our course, any action, whatever its nature. A victory of fascist Germany in this war would have immeasurable, frightful consequences. The White Rose group believed the attitudes and actions of the young people of Germany could change the course of the country. If the young people would unite then they had the potential to overthrow Adolf Hitler and the Nazi government. In one leaflet, Fellow Fighters in the Resistance, they wrote: The name of Germany is dishonored for all time if German youth does not finally rise, take revenge, smash its tormentors. Students! The German people look to us. The White Rose group also began painting anti-Nazi slogans on the sides of houses. This included Down With Hitler, Hitler Mass Murderer, and Freedom. They also painted crossed-out swastikas. On February 18, 1943, Sophie and Hans went to the University of Munich to distribute the sixth leaflet published by the White Rose. A janitor and member of the Nazi Party, Jakob Schmidt saw them and called the Gestapo. The two were arrested and searched. They found a handwritten draft of another leaflet in Hans' pocket. The writing on this letter matched the writing of a letter the Gestapo found in Sophie's apartment that had been written by Christoph Probst. Christoph was arrested soon afterwards. A few days later, after intense interrogation, Hans, Sophie, and Christoph were brought before the People's Court on February 21, 1943. Judge Roland Freisler presided over the hearing. The result was that all three were found guilty of treason and condemned to death. According to German law there was a 90-day waiting period before the death sentence could be carried out, but this was ignored. The Scholl's parents barely had time to travel to Munich and say their farewells to their two children. On February 22, 1943, Hans, Sophie and Christoph were executed by guillotine. Just before he was executed Hans Scholl shouted out: Long live freedom! Before the executions were carried out Hans tried to gain freedom for his sister by claiming that he was the only one involved. The gestapo agent who interrogated her gave her the opportunity to blame all the actions on her brother as well, so that only Hans and Christoph would die. Instead, Sophie took all of the blame, claiming that it was she and Hans alone who instigated the leaflets and that Christoph should go free. Christoph Probst was married and had three small children at home. Both of the Scholls tried to get Probst cleared of any charges because of his young family. Several other members were also executed later and some received prison sentences. After the arrests of the original friends of the White Rose, a group of chemistry students at the University of Munich took up their cause. Armed with only a typewriter, they copied out hundreds of the leaflets and continued disseminating them. Many other groups used the White Rose leaflets in their resistance efforts. Copies of the leaflets were smuggled out of Germany, into Sweden, and finally made their way to England. The British Royal Air Force dropped plane loads of the sixth leaflet, Dr. Huber's, on Germany. In June of 1943, emigré German novelist Thomas Mann dedicated his regular BBC broadcast for Germans to the White Rose. He quoted words Sophie Scholl was supposed to have leveled at her Nazi judge, "Soon you will be standing where I am standing now" and he concluded with a statement he had used as a kind of motto for the broadcast, "A new belief in freedom and honor is dawning." 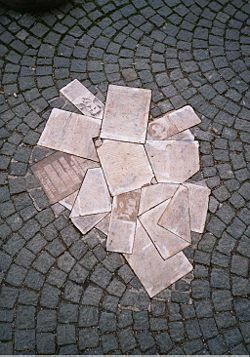 The square where the central hall of Munich University is located has been named Geschwister-Scholl-Platz after Hans and Sophie Scholl, the square next to it Professor-Huber-Platz. Many schools, streets and places all over Germany are named in memory of the members of the White Rose. They are considered heroes by the people of Germany, and many young people today look to their example for inspiration. In an extended German national TV competition held in the autumn of 2003 to choose the ten greatest Germans of all time (ZDF TV), Germans under the age of 40 voted Hans and Sophie Scholl to fourth place, selecting them over Johann Sebastian Bach, Goethe, Johannes Gutenberg, Willy Brandt, Prince Otto von Bismarck, and Albert Einstein. The group's activities were the subject of three German films: Percy Adlon's Fünf letzte Tage (1982), Die weiße Rose (1982), released in the United States (subtitled) as "The White Rose"; and Sophie Scholl – Die letzten Tage from 2005, directed by Marc Rothemund. In 2003, a group of college students at the University of Texas in Austin, Texas started an organization named The White Rose Society dedicated to Holocaust remembrance and genocide awareness. ↑ Hans Scholl, Jlrweb.com. Retrieved December 8, 2007. ↑ In Memoriam, Deheap.com. Retrieved December 7, 2007. ↑ Remembering the White Rose, History.ucsb.edu. Retrieved December 17, 2007. ↑ Bruce Stanley, 2006, The White Rose, Miami.indymedia.org. Retrieved December 7, 2007. Hans Scholl. Spartacus.schoolnet.co.uk. Retrieved December 7, 2007. The White Rose: A Lesson in Dissent – Jewishvirtuallibrary.org. Memories of the White Rose – Historyplace.com. Remembering the White Rose:German Assessments, 1943-1993 – History.ucsb.edu. This page was last modified on 27 July 2017, at 22:54.